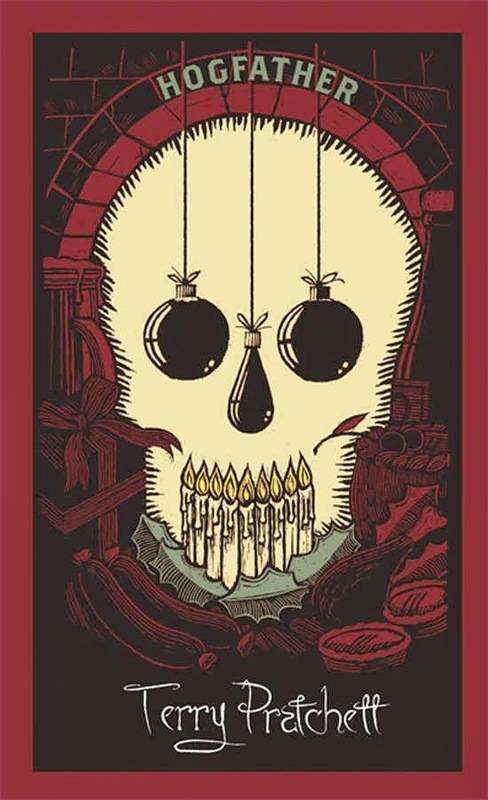 Warm Vellum Book Blog: Un-Review: "Hogfather" by Terry Pratchett, plus further Pratchett love. Un-Review: "Hogfather" by Terry Pratchett, plus further Pratchett love. 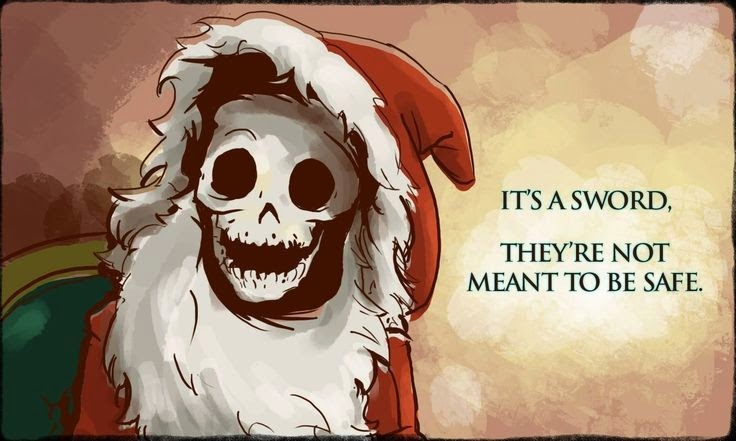 I read 'Hogfather' by Terry Pratchett over Christmas, and not for the first time. I tend to read the book in the run up to Christmas, as the festive excitement is just bubbling inside but the trudge of work is constantly threatening to stifle it. I find that a good dose of Discworld goes a long way in curing most ailments, and if you can just choose the right Discworld novel to read at that perfect sweet spot, everything will make sense. 'Hogfather' concerns the death (sort of) of The Hogfather on Hogswatch Eve at the hands of the psychopath assassin Mr Teatime, and the trials of Death himself and his granddaughter Susan as they attempt to rescue Hogswatch, and as such, the World. It is as amazing and mad as it sounds, and much much funnier and warmer than you would expect. Death himself posing as the The Hogfather in a department store grotto is a highlight! I have indeed found the sweet spot to read 'Hogfather', and it never gets old, despite yearly re-reads. This book does what all good Terry Pratchett novels do - takes everything that is good, sweet, moral and right, then coats it with a sizeable dose of cynicism and raises a questioning eyebrow in its general direction, and tickles it with a stick until it laughs. This and all Discworld novels are full of heart and soul, totally lacking in sentimentality and completely hilarious. The only mistake I made was to pick the book that suited me seasonally, rather than follow any sort of assigned reading order to the Discworld books. I have now read the first and last (so far) novels of the 'Death Collection' and skipped the middle two, and a considerable amount of time had passed between 'Mort' and 'Hogfather'! I am currently filling in the blanks, and am reading the other 'collections' in order over time - I have started the 'Witches' and 'Wizards' collections and have read every single one of 'The Watch' novels. Logically 'The Colour of Magic' would be the first books to read - the first book written and the first of the 'Wizard Collection' - but I would thoroughly recommend reading 'The Watch' books first. Commander Vimes and Captain Carrot are my favourite characters in almost any book, nevermind in Discworld. 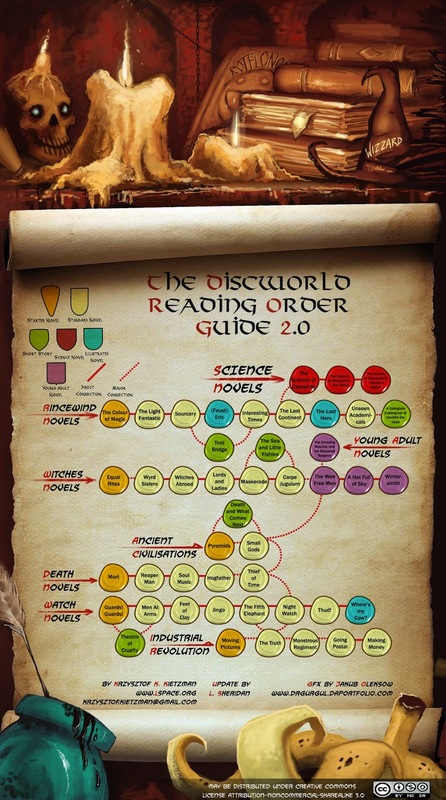 The world is split into fans of the Discworld novels, and soon to be fans of the Discworld novels. I hear people say a lot that they just 'couldn't get into it' about Terry Pratchett books, but I assure you, if this is the case you are just starting in the wrong place on the wrong Discworld book. These books are perfect, mood enhancing, magical tomes - read them all. When I read a Discworld novel, particularly one focussed on The City Watch, I not only feel happy and fulfilled, but somehow want to be a better person (but not a twee, simpering, 'nice' person - not the same thing!) - remember, we all have warts, some of us are just lucky enough to have them hidden under out clothes. Read a Discworld book if: you want to be part of a world other than the one we live in but that is just as real/you feel tired and cynical of human nature and behaviour/you are looking for that 'Pollyanna' feeling but without the sentimentality/you need a good laugh - unashamedly and in public preferably/you have not experienced the milk of human kindness in a while and need your faith restoring/you want a fantasy without world ending, epic reaches (the washing-up still have to get washed you know - you can't rely on the sun not coming up! ).